"We’re so impressed at the creativity and enthusiasm that PPA teachers put into lessons/activities. The kids have a great time and don’t even realize that they’re retaining important information." 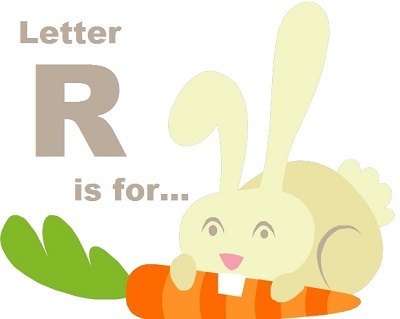 “Letter R is for Rabbit Week” is next! “Letter Q is for Question Week” was … great! 🙂 Compared to Letter P last week, Letter Q’s share box was definitely not as full. 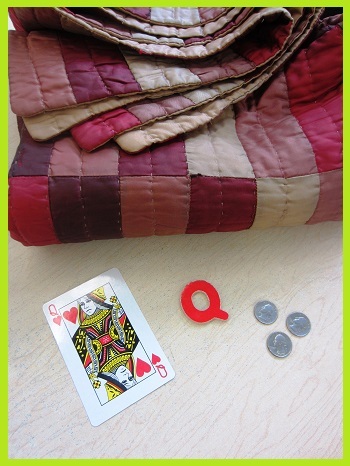 The letter Q share box contained such Q items as quails, Q-Tips, “quicksand”, and even a queen! Speaking of queen, the most famous race car of all – Lightning McQueen – made his way into the share box this week! Take a look at some of the other letter Q shares that were sent in throughout the week. Throughout the mornings at the beginning of the week, the students worked on their letter Q identification activities. The older students worked diligently while some of the younger students worked quickly. Either way, the students did a great job. The hard work continued into the afternoons where the students created a surprisingly long letter Q list. 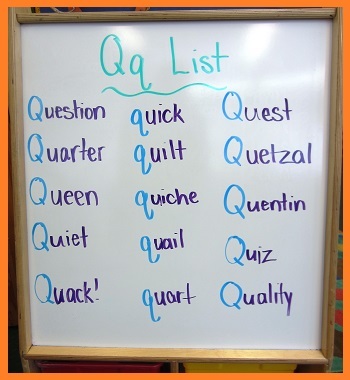 The students all chuckled when someone suggested “Quetzal” for the list, thinking that the student was mispronouncing the word pretzel. Fortunately, the teachers were there to affirm the student’s addition to the list and show a picture of a Quetzal! 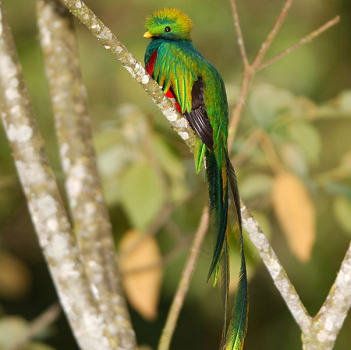 Here is the letter Q bird known as a Quetzal – it is quite beautiful! Also, in the afternoon on Monday and Tuesday, the students brainstormed a list of questions that they wanted to “investigate” later in the week. The Monday students voted and picked one question from the question list to investigate on Wednesday and one question to investigate on Friday. The Tuesday students picked one question from their question list to investigate on Thursday. Keep reading through the entry to learn what questions they asked and explored each day this week! The students began their morning by working in groups to discuss everything they knew about ice. They concluded that ice is water that had frozen. When asked what the word frozen meant, the classroom erupted into song and dance as the students began acting out and telling the teachers all about EVERY detail of the new hit Disney movie, Frozen. Once the performances of “Let It Go” and “Do You Want to Build A Snowman?” wrapped up, the students went back to their scientific investigation of the question. It was determined that frozen meant very cold. To test this idea, the teachers poured some REALLY COLD water into a water balloon and asked, “Is this frozen?”. The students giggled as they squished the cold water balloon in their hands and explained to the teachers that the water balloon was not frozen! The teachers reminded the students that they had identified “frozen” as really cold water – perhaps they wanted to add another descriptive word to help make their definition more fitting. The students said, “Frozen means really cold and really hard”. The teachers, anticipating their answer, headed to the Park Prep freezer and pulled out another water balloon. When asked to describe how it felt, the students remarked that it was cold, hard, heavy, and definitely FROZEN! When asked how that happened, the students explained that when water gets cold, it gets hard and freezes which is called ICE. They were right! Now, it was time to figure out what makes ice melt? To help with the students’ investigating, the teachers filled several water balloons with water (the evening prior) and placed them in the freezer. The teachers explained that when water freezes, it also gets bigger! By Friday, the water balloons had frozen and as they suspected, they got even bigger! How exciting! To test what makes the ice melt, the students discussed and observed the effects of body heat, cold water, warm water, and salt on the ice. For some extra fun, the teachers included a few classroom items inside the soon-to-be thawed out ice balloons. What a fun and scientific day it was! To start the discussion, the students hypothesized about why skunks spray that stinky spray. Are skunks mean? Do skunks like stinky smells? With a little help from a classroom favorite, What Do You Do When Something Wants to Eat You?, the students learned that skunks are not just being mean when they spray but rather they spray to protect themselves from other animals trying to eat them! The predator (animal trying to eat the skunk) will not like the smell and run away to avoid it! This helps the skunk get away safely! To help remember this fact, the students created the following art project! During the afternoon on Thursday and Friday, the students had Spanish class where they reviewed their Mi Cuerpo (My Body) vocabulary by playing Simón Dice (Simon Says). 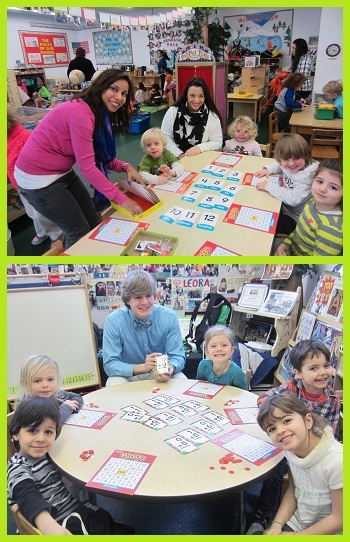 On Friday, the students were visited by representative from Math Wizard in Hoboken! Two representatives, Ms. P. and Mr. Colin, spent the morning at PPA working in stations with the students on various number games! Whether it was addition bingo or number identification matching, the students surely had a blast! A special PPA Thank You to Ms. P and Mr. Colin for spending the morning with us! To begin, the students looked at photographs of flamingos and saw what they look like while standing on both legs and what they look like on one leg. The students began by hypothesizing about why they do this? Here are some of the answers they came up with. Flamingos are really good at balancing and gymnastics! Maybe the flamingo hurt his toe? Flamingos are silly and just like standing like that! After viewing a technology presentation, the students learned that for a while the answer to their question was unknown even by flamingo experts! Scientists thought that flamingos stood on one leg to get a “leg up” on the predators who try to chase them. Scientists also thought flamingos stood like this to show if they were girl flamingo or boy flamingo. These two flamingo ideas proved to be incorrect and the real answer was determined by observing (watching) flamingos and their behavior. Scientists saw that flamingos stood on one leg mainly when they were standing in water. They also noticed that flamingos tended to stand on one leg more often when the water was cold then when the water was warm. Scientists concluded that flamingos stand this way to help them stay warm! To test this idea, the teachers asked the students who were sitting “criss cross apple sauce” to hug their knees tightly into their bodies. After a few seconds, the teachers asked how the students felt all balled up. They replied that they were very warm. Just like the students, flamingos stand on one leg to “curl up” and stay warm! To help remember this fact, the students created the following flamingo art project! The students clearly had a great time exploring and investigating these questions during “Letter Q is for Questions Week”. It may be the end of Letter Q week but that does not mean the questions have to stop! As we get ready for Letter R week, Remember to keep asking questions and keep learning! Enjoy the weekend!